It’s that time of year everyone… the time where bloggers are all posting their most popular posts of the year – and I’m no exception. I thought it’d be interesting to see which of my posts did the best this year. I can tell you one thing, 2015 has been the best year for my blog by far when it comes to visitors and views – it beat last year by a good 5,500 views! I realize 7,000 blog views is nothing to big bloggers, but for me… that’s pretty awesome. There are posts that I published thinking they’d skyrocket in views, but it never really happened for any of those particular ones. Posts that I didn’t think would make the top did better than I expected, but isn’t that how it always goes? 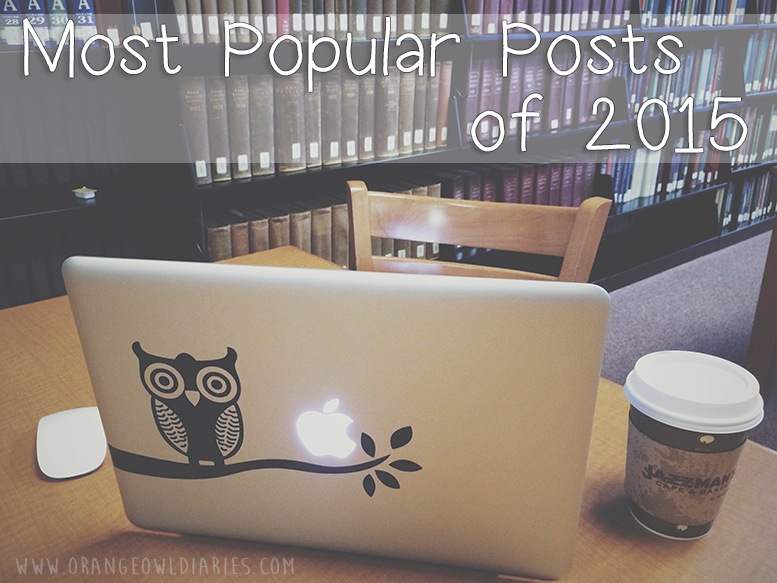 So here are the most popular posts of orangeowldiaries for 2015! The Sorting Hat Tell No Lies – the winner of most popular post won by a landslide. It beat the second post by 400 views for the year. They were both published earlier in the year, but still about 20 months apart. A Work in Progress [book review] – my review of YouTuber Connor Franta’s autobiography. You Might Be From Connecticut If… – a list of things that you will definitely know/experience if you’re from the 3rd smallest state in the United States. My Essential iPhone Apps – a short list of some of my favorite iPhone Apps in 2015. Though I might be due for an update on this post, or follow up, in the beginning of 2016. Worrying About Worry… it’s not just me! – a post from Blogging 101 where we had to write a response post to another blogger’s post. Worrying is something I constantly struggle with and it’s something we all actually deal with on some level. Grandpaland and Movie Credits – a post about my experience this summer working on an independent film and getting to see my name in the credits on the big screen! I Just Wanted My Mom – my experience where I felt like I would most likely end up in the hospital and all I could think were two things – “God, please don’t let me die” and “I want my mom” – because no matter how old you are, if you don’t feel good you just want your mom. So those are my top seven most popular posts of 2015. Looking at them I really shouldn’t be surprised that the Sorting Hat post was the more popular… I mean, think about how popular Harry Potter is. For that matter, Connor Franta’s book was a pretty popular topic at the beginning of this year, so that isn’t a huge surprise either. All the others were a surprise for me though that they made the top. What this shows me is that usually sharing my experiences bring in the most views for my blog, which is all I really wanted to achieve with this blog – sharing my experiences. That’s always been my purpose for this blog and it’s not changing anytime soon. So no matter how many tag posts or currently posts I do, I will always be sure to share my experiences in hopes that my blogging friends and readers can relate. Here’s to a another year of blogging in 2016!